Makers and hobbyists but would like to do small laser engravings may be interested in a new compact desktop laser engraver called the Cubiio which is launched by Kickstarter this week and has already raised nearly $200,000 with still 35 days remaining on its campaign. Watch the demonstration video below to learn more about this palm size laser engraver that can be easily set up and uses a picture or G-Code file to create an engraving. As well as coming with its own companion application that allows you to draw directly on your tablet screen and then laser engraved on a wide variety of different materials including wood, leather, cardboard and more. The developers of Cubiio explain more about its design and setup. 1. Choose a picture / G-Code file or write something in Cubiio App. 2. 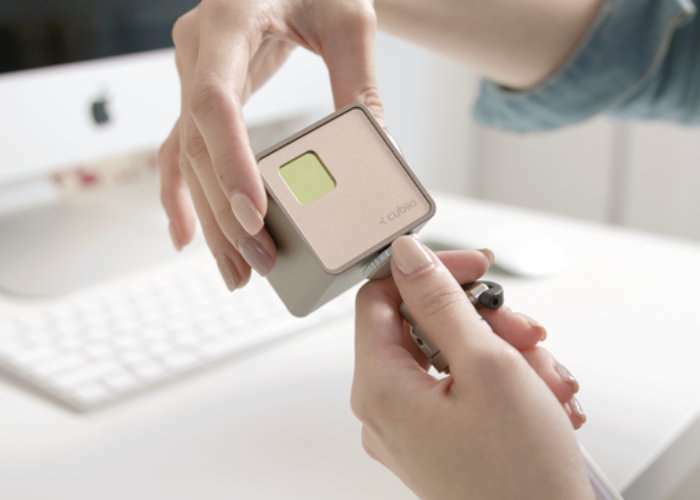 Place the item you want to engrave in front of Cubiio. 3. Preview and align. This convenient feature will be described later. 4. Press START and enjoy. Cubiio is now available to back via Kickstarter with early bird pledges starting from just $299 and delivery expected to take place during November 2017. For full specifications and more information jump over to the official Kickstarter campaign page via the link below.